The place to look for news related to SAA and its members. Check out the events page for details on the upcoming trials. Information coming soon for fall 2018 classes. Stay tuned. Jan Gray was a club member who died in 1998 after a lengthy battle with cancer. 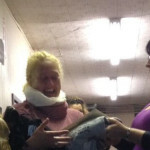 She was an enthusiastic member with a great sense of humour who put many behind the scene hours into club activities. She loved nothing more than spending quality time with her dog, Bandit. This award is presented to a member of our club who demonstrates a love of animals, enthusiasm for and enjoyment of the sport of agility and a willingness to participate in the activities of the club. This member consistently teaches classes and is very respected by the students. She also has taught many classes, trained her own dogs, participated in many club activities as well as mentored many members and students. 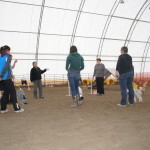 Her calm, supportive manner while teaching relaxes the students and encourages them to connect with their dogs in a positive way. When working with her own dogs, she uses the same kind, calm manner and the results are smooth, pretty runs and happy dogs. The recipient of this year’s award has diligently and accurately kept our club’s books balanced for many years. She processes fees and makes sense out of funds and notes given to her without a complaint. In addition, Susan attends almost all meetings, sets up equipment, shows up for work bees and is always asking if she can do this or that to help, and all this with her awesome, quiet sense of humor close at hand. 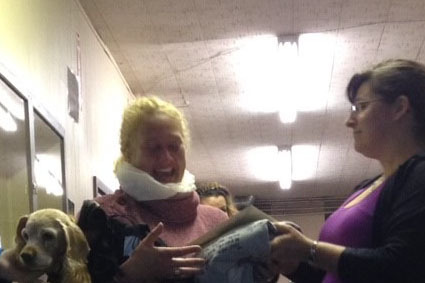 Thank you Susan Gossen for being an integral backbone of SAA. You are very much appreciated as a member of this club. This award is presented to a handler-dog team that has worked hard together and made progress in the sport of agility. The recipient of this award is a member who has demonstrated the patience, diligence and commitment needed to improve in agility. The team receiving this year’s award have worked together, on and off the agility field, and have gained confidence and skill. Starting to train with a new agility dog can provide unique challenges. Anyone who has done it can relate. You are starting back at square one. You are not just training the dog but also yourself. As a team, you are learning to read each other’s movements and cues, adapting to changes in handling and speed. One dog may have been boisterous, vocal and confidently running ahead, but the new dog may be quietly watching and reacting to the smallest twitch of your arm or shoulders. You have to remind yourself that the new dog doesn’t have the same experience and confidence. And the new dog will remind you that some of the stuff you could get away with other dogs just isn’t going to work anymore. Hours of training and commitment have seen this team progress. They are working well as a team. 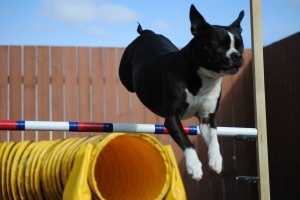 We have seen their confidence grow and have seen them start to compete at agility trials. This member unexpectedly lost her two previous agility dogs when they were quite young, and really just hitting their stride in the agility ring, but she never gave up on the sport of agility. She has continued to put her time and energy into training and creating a very special bond with her new partner. 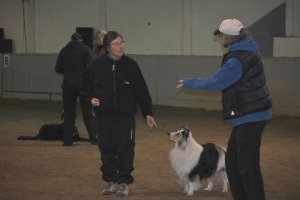 She has taken this little dog up the ladder to the Intermediate level and is a pleasure to work with in classes. 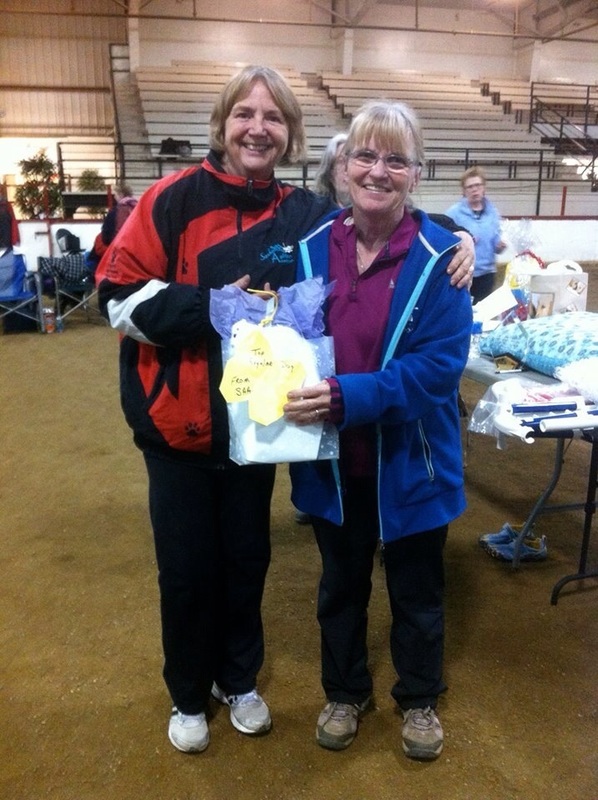 This year’s very deserving recipient of the “We’ve Come a Long Way Baby Award” are Sandy Roberts and Ella. This award is presented to the club member who has put time, love and patience into working with a dog with behaviour problems or special needs. 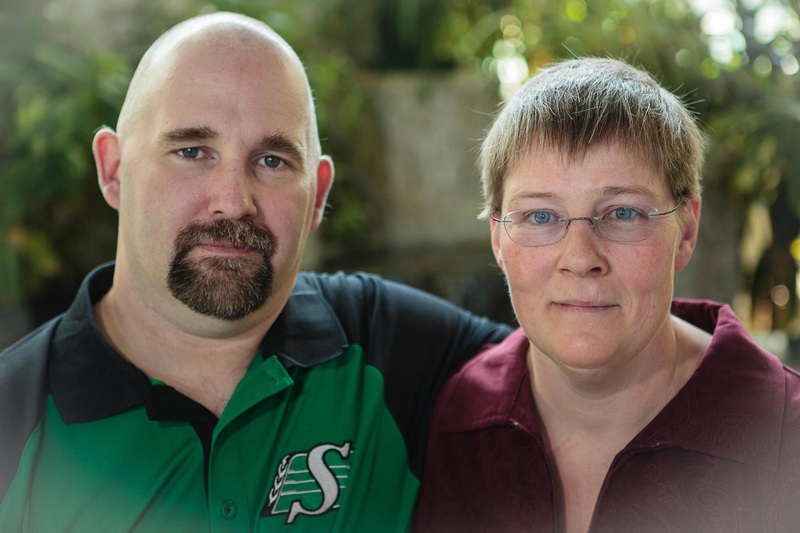 This year, the members being honored with this award are Andrea and Greg Serack. They both have demonstrated the extra effort needed to gain the trust of an insecure, abused, or special needs dog in so many ways. Andrea and Greg’s journey into agility and with our club started with Tyke. In an effort to give Tyke confidence and to heighten his other senses when he started losing his sight, Andrea trained with bells on her hands and feet so that he would be able to follow her. Andrea called out to him and gave him direction, Tyke put his trust in her and did just as he was to do and thus their very special partnership grew. 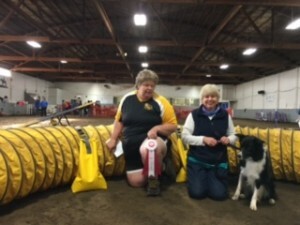 One nomination seems to sum up what so many of us have thought and commented: “The most amazing thing in the world of agility that I have ever witnessed is the run that Andrea and Tyke completed at the June trial. That run showed the love, trust and support required in a team to succeed.” At the last trial Tyke was able to compete in this past year our judge video-taped Tyke and Andrea’s run from her vantage point in the ring because she said she had to be able to show others at home this incredible team. 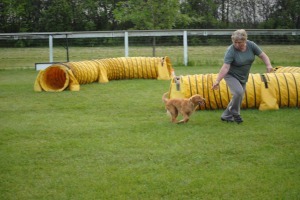 Greg has worked very hard with Willow and has progressed and grown with her in the sport of agility. Greg has learned to be calm, supportive and positive in his training and this has paid off with Willow, who is very sensitive to stress. It is a pleasure to see him competing with Willow and both so happy to be running together whether she cues or not. As Greg and Andrea became more involved with their Boston’s they also started to become more involved with the Boston Terrier Rescue Group. It is impressive to see the work they are doing for the love of dogs and this breed in particular. This leads us to the newest members of their family, Zeus and Miss Macy. Both are learning to trust, love and play under the guidance, hugs and kisses of the Seracks. Zeus is learning to become a team mate to Andrea; Greg has taken a particular affinity with Macy, whom he affectionately calls George. When they decided (maybe) that their house was just about full, a new challenge presented to them and they decided to foster for the Boston Terrier Rescue. They rescued and took in Dolly, showed her their special kind of love and family, worked with her and worked to find her an excellent forever home. Monday nights is St. John Therapy Dog night, another way that they have grown together and have found a way to pay it forward. The Serack family go for a car ride and spend time with patients that need the attention of some cuddly Bostons. The Seracks both take time with the dogs in their classes. 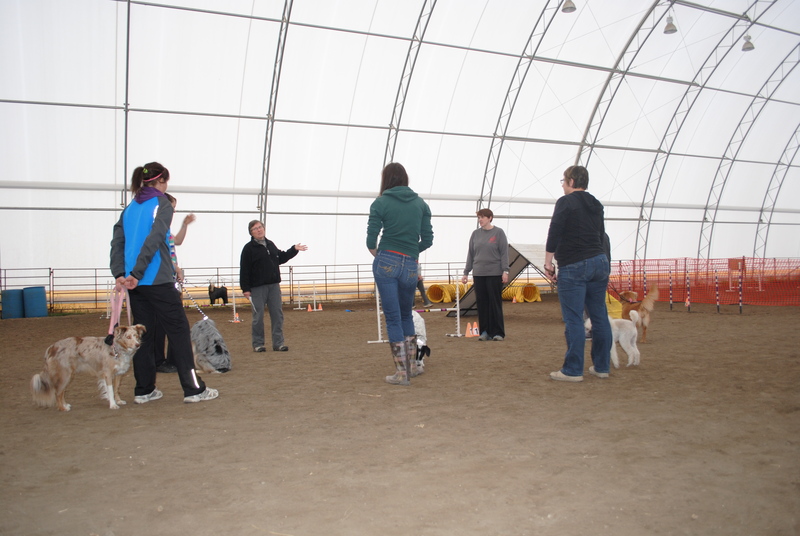 They encourage and support their students and take time to discuss and offer suggestions to the new handlers with dogs that show problem behaviours. 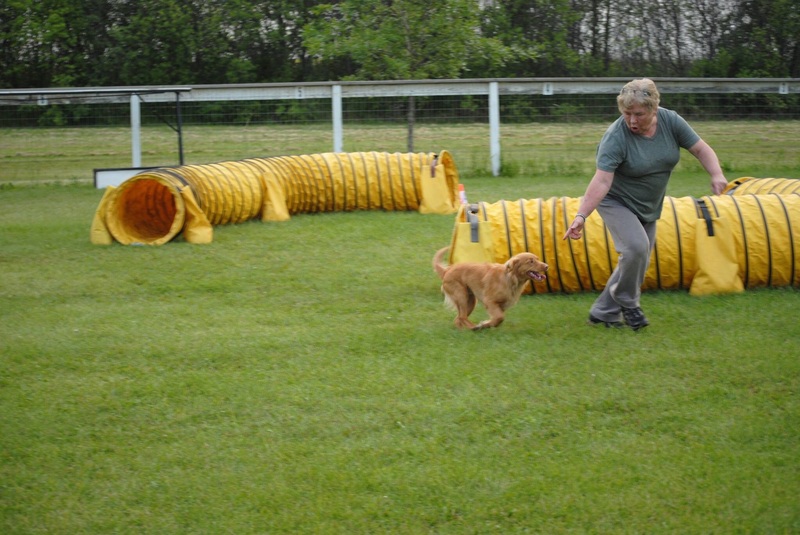 Andrea and Greg’s love for animals and enthusiasm for the sport of agility is obvious and endearing. By taking one look at their (very spoiled!) four legged family, you know these pups are very lucky to have Andrea and Greg as their parents. This team is truly many dogs’ best friends. Upcoming trial dates for 2014. October Trial happens Oct 18th and 19th! Our Fall trial takes place this weekend. Important pre-trial information can be found on the events page. Here are a few highlights. · Ring set up 4 to 6 p.m.
Time to think about fall classes! We will be holding agility classes in the fall. We will be offering several levels of classes including beginner! Classes run Tuesday evenings beginning late September or early October. Now is the time to let us know if you are interested in attending. You can contact us by email at saaagility@gmail.com to get additional information and get your name on the list for classes. Our classes sizes are limited so get your name in early. 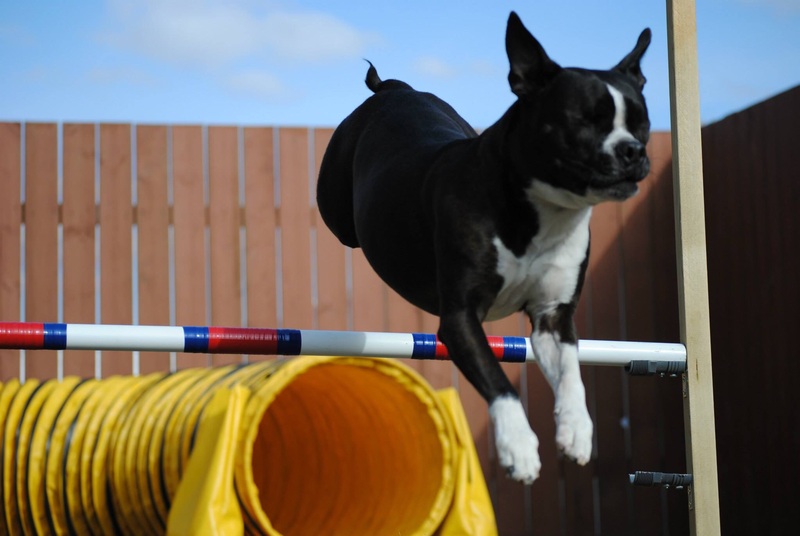 SAA is happy to announce that we will be back to doing an agility demonstrations at Watrous Fun Run again this year. The date is Saturday July 26, 2014. It is great fun for the whole family. We look forward to seeing you there. The demos will take place at 11am and 1:30pm. AAC Regionals for SK/MB/NU was held May 3-4, 2014 in Moose Jaw, SK. 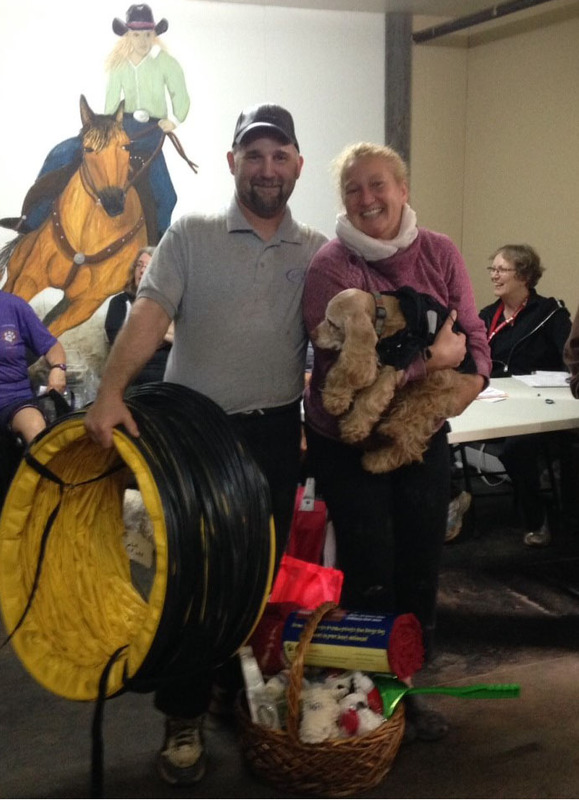 Special thanks to FurEver Fun Dog Sports and Standsure Agility for hosting! 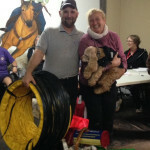 Saskatchewan Agility Association sponsors the Top Regular Dog award. We would like to congratulate Sharon Weekes and Wager with- 584.54 points. We would like to congratulate the SAA members that competed in regionals this year. 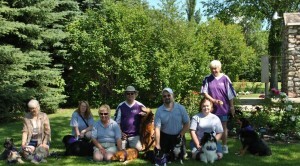 This year 6 members and 8 dogs from the club competed. 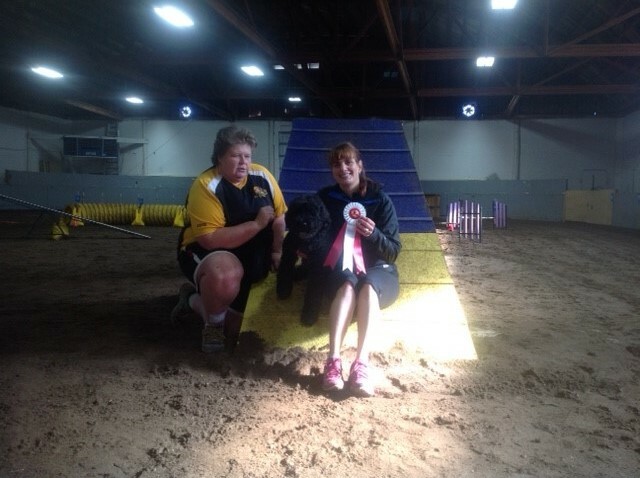 Angela Koop and Jake received the “Just Squeaked By” award Sponsored by Agility in Manitoba. Susan McIntyre received the “Sportsmanship” award sponsored by Mut Hut Agility.